After a strong start with last week's premiere, "The Good Wife" is following up with the Cary/Bishop arc and introduces Taye Diggs as this season's guest star. While not nearly as legally dense as the previous episode, "Trust Issues" lays down some interesting breadcrumbs for what's to come -- for Alicia's political career, for Florrick/Agos, and for Cary's freedom. Usually we enjoy Eli Gold's puppetmaster routine, but ever since Eli focused his manipulations on getting Alicia to run for State's Attorney, we've been treated to at least 20 obnoxious minutes of Alicia telling people she isn't running. Meantime, Cary spends most of the episode in jail after Bishop's highly illegal bail money was pulled (shock). Our old favorite fake social media client ChumHum is back, and this time they're being accused of some sort of collusion with competitors to stop poaching programmers. And Taye Diggs joins the cast as Dean Levine-Wilkins (thanks IMDB) as a large chunk of Lockhart/Gardner is jumping ship to Florrick/Agos. The ChumHum storyline was indeed ripped from this summer's headlines, as Apple, Google, and others offered $325 million to settle hiring lawsuits alleging that the companies secretly agreed not to poach each others' talent. This wouldn't be the first time tech companies were caught colluding -- e-books come to mind. This episode was low on legal fiction -- largely because there was little courtroom or legal action -- but we were left wondering: If the allegations and evidence against Bishop are so weighty, how did Florrick/Agos manage to get his subpoena quashed? In other words, calling Alicia to the stand seemed to be mostly for dramatic effect. Like we worried last week, turns out Cary's bail money very clearly was from an illegal source and (duh) not eligible for actual bail. Also, although Alicia delivered it like she had unearthed some sort of "Good Will Hunting"/"Beautiful Mind" revelation, you can't have an agreement without both offer and acceptance. If no one at the other companies took Deena Lampard seriously, there was never a meeting of the minds and thus no agreement to collude. Hostile witness: Former nice guy ASA Finn calls Alicia as a hostile witness to testify at the bail hearing. This doesn't mean Alicia wasn't keeping her cool, it simply means that the prosecution can call her and ask leading questions -- which are normally objectionable. "Trust Issues" wasn't quite as legally meaty as "The Line," but we can't wait to see what Taye Diggs adds to the show. Also Cary is out of jail, so there's that. What did you think of this week's episode of "The Good Wife"? Is the show guilty of making any legal mistakes? 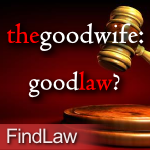 Check back here for more legal recaps of "The Good Wife," and send us a tweet at @FindLawConsumer with the hashtag #TheGoodWife.